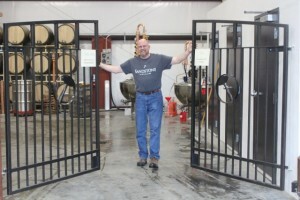 It’s at the end of a winding drive through the bucolic cattle pastures and alpaca farms of Tenino that you’ll find the large red, purpose-built warehouse encompassing Sandstone Distillery. What you might not know after stumbling upon it is that it’s Thurston County’s sole craft liquor production site, and the first to open there since Prohibition. 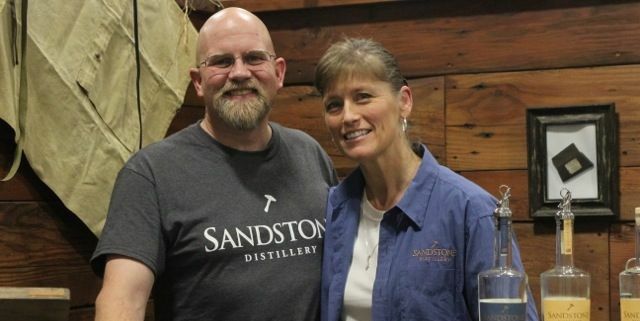 John and Jenny Bourdoun are the husband and wife team behind Sandstone Distillery. As he shows off frays in the giant timbers where Jenny’s mare once gnawed in the old barn, it’s clear that the entire facility is a museum of local stories. Just inside the door, near the tasting credenza, is a tinted late-19th century photo of one of Tenino’s famous stone carvers. Atop the ochre dividing walls of the foyer are an antique chisel and carving tool once used in the city’s famous stone quarries, which a century ago fueled its economy. In the restroom is an old photo of that stone operation. Along the gravel drive, the building itself is fronted by a massive boulder hewn with the distillery’s name. The Bourdons are eager to highlight this history as they begin the walk through the facility, a well-practiced tour they’re getting more and more used to giving impromptu these days. Word of mouth about the distillery’s unique business spin is spreading fast throughout Puget Sound, as well as reverberating praises for its high-quality, reasonably-priced liquors. In recent weeks, the family has hosted stop-in and tastings for passersby from Port Orchard, a band of North Thurston firefighters, and a scattering of curious Puget Sound restauranteurs and bartenders who have heard the word that Sandstone is something special. 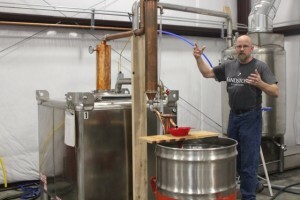 John Bourdon describes the distilling process during a recent tour. Indeed, inside the timber-hewn foyer with its tasting stand and wall of Sandstone Distillery shirts and souvenirs, a set of iron gates open into a production facility that’s not only functionally sparse in design but also captures history in every piece of equipment. A set of gleaming metal cooker tanks and boiler pipes, designed by John, steam from one side of the clear cement floor. These are flanked by oversize sacks of grain from Eastern Washington farms. On the right are a duo of oversize kettles whose former lives were as soup tanks on a 1970s Navy ship — today they’re dubbed “Hark” and “Herald,” for angel figures John one year proposed to his family as toppers for a double-spiked Christmas tree. Drinking glass-sized “plates” perch above each: a stack of four creates lower proof, more flavorful whiskeys; an eight-stack distills cleaner, higher proof vodkas. “Hark” and “Herald” are the oversized kettles that are part of the craft liquor production site at Sandstone Distillery. In which forms those spirits appear is often the genius of Jenny, who by day runs an Olympia surgical facility, and who by night and weekend concocts liquors infused with sweet and savory natural flavors. From the Bourdon’s own acreage come extracts of blackberries, apples, rosemary and mint, while botanicals like sweet orange, cardamom, cassis, cinnamon bark and licorice root are sourced from as close to home as she can get. For her most frequent seasonings, the upper walls of the warehouse are lined with narrow shelves of small planters, which feed off the steam from the cookers. Currently two gin varietals feature lemon or licorice, the latter of which she says is surprisingly favored by men. A jalapeño vodka has found its way into the local Mexican restaurant’s menu. The dining venue at Offut Lake Resort has signed on to use the Sandstone white whiskey in its holiday “White Christmas” hot chocolate drink. And regional foodies and spirits connoisseurs throughout Puget Sound, including Governor Jay Inslee’s executive chef, are tasting and buying up the limited batches of bottles — which are themselves slim and elegant glassworks, with a local artist-designed label featuring the hands of a Tenino stone carver at work. Jenny Bourdon concocts the liquor flavors, mostly based on what’s growing on their Tenino acreage. As for any small business, though, the Bourdons’ road hasn’t been simple. After owning a successful trucking company, and subsequently embarking with the family on a cross-oceans sailing excursion, while Jenny was at work John began dabbling in distilling from home. That turned into an investment in education on the distilling process, focused on learning how to run such a business. Breaking into the state’s undefined liquor industry, though, with all of its recent tax additions and rules, also led to involvement on state liquor discussions at the legislative level, where parameters for everything from distillery fire codes to tasting room guidelines to labeling formats were on the table. 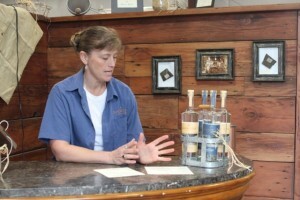 John and Jenny Bourdon would love to share their craft liquor distillery with you. 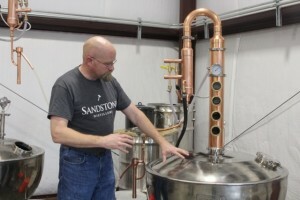 As the tour winds down, John describes the path for Sandstone Distillery’s next few months. “We just want to hold steady, to keep selling out of our own backyard.” By 2016, the couple is aiming to build a self-sustaining portfolio throughout the Pacific Northwest; by 2020, they’re looking to be recognized across the U.S. and in Asia. The caveat, says Jenny, who keeps the books, is that the business must always be self-supporting. Expansion is eventual, and inevitable: set hours for visits, tour group capabilities, educational outreach, and in-house “Distiller for a Day” experiences. These are all ideas that the couple is closely embracing. 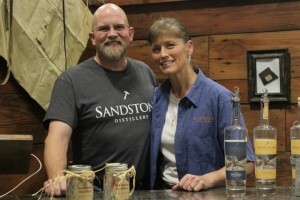 You can learn more about Sandstone Distillery on their website or by following the business on Facebook. Driving directions can be found here.